Background: Inhibition of Dipeptidyl peptidase IV (DPP IV) enzyme is an attractive and appropriate target for the treatment of type 2 diabetes. In order to discover for potent DPP IV inhibitors a chemoinformatics studies were performed on fifty nine trifluorophenyl β-aminoamide derivatives using Sybyl X 2.1.1. Methods: The comparative molecular field analysis (CoMFA), comparative molecular similarity index analysis (CoMSIA) and hologram quantitative structural activity relationship (HQSAR) and docking techniques were selected, validated and optimized by a test set of fifteen compounds in order to design new molecules. Result: The values of cross validated r2 (q2), non cross validated r2 and predicted r2 were for CoMFA (q2=0.854, r2=0.928, pred. r2=0. 932), CoMSIA (q2 =0. 864, r2=0. 924, pred. r2=0.922) and HQSAR (q2=0.826, r2=0.942, pred. r2=0.705), respectively. Conclusion: The structure activity relationship of selected analysis suggested that bulky and electron withdrawing substituents at 2nd and 3rd position of piperazine ring; bulky and electron withdrawing substituent at R position and less bulky and electron donating substituent at 5th position of piperazine ring were favorable for inhibition of DPP IV enzyme. In docking analysis (3W2T pdb) amino group and carbonyl group of compound 44 formed hydrogen bond interactions with Glu 206, Tyr 662 and Arg 125 respectively at active site of DPP IV enzyme. The present work finding may be helpful in the designing and optimization of novel DPP IV inhibitors. Keywords: CoMFA, conformational analysis, diabetes, DPP IV, trifluorophenyl & beta;-aminoamide derivatives. Keywords:CoMFA, conformational analysis, diabetes, DPP IV, trifluorophenyl & beta;-aminoamide derivatives. Abstract:Background: Inhibition of Dipeptidyl peptidase IV (DPP IV) enzyme is an attractive and appropriate target for the treatment of type 2 diabetes. 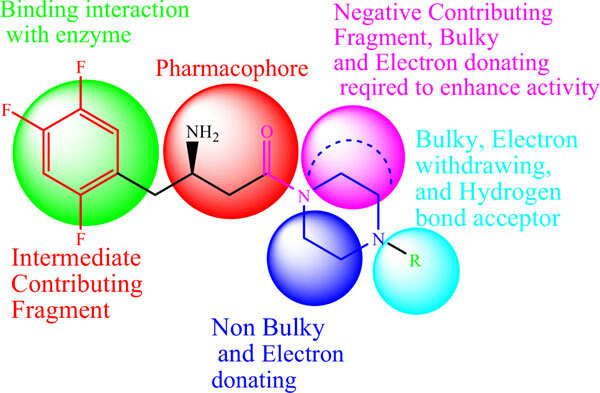 In order to discover for potent DPP IV inhibitors a chemoinformatics studies were performed on fifty nine trifluorophenyl β-aminoamide derivatives using Sybyl X 2.1.1.